I’m half-way through my midday americano, when I suddenly remembered today’s the day. I pack up my planner and search for the nearest post office. Two minutes later I’m standing in front of Mrs. Pacindo at the USPS in Independence, Ohio, gleefully asking for the new Love stamp. By the look on her face, I could tell she thought I was a little too excited about a stamp. 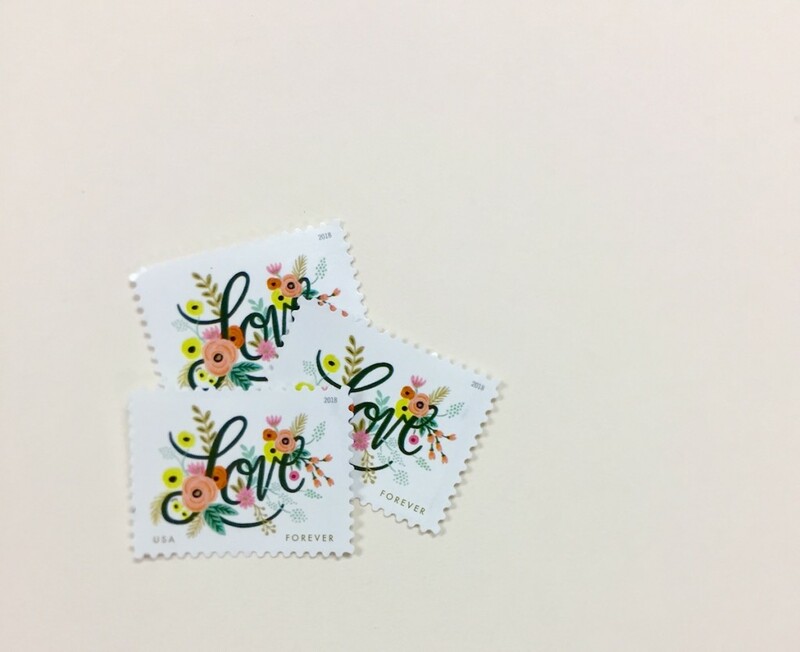 But today is the day that love flourishes for stationery enthusiasts, as the new USPS Love Stamp designed by Anna Rifle Bond (of Rifle Paper) debuts. The Love Flourishes stamp art features a fanciful garden of colorful flowers surrounding the word “Love” written in cursive script. Hand-painted with opaque watercolors on paper by artist Anna Bond, the original art is whimsical and vibrant, at once retro and timeless. The flower garden includes stylized roses, peonies, and dahlias in pink, coral, and yellow, with pale blue-green berries and gold fronds and leaves. The word “Forever” appears in the lower right-hand corner of the stamp, and “USA” is on the lower left. Art director Greg Breeding designed the stamp using Bond’s original art. I have to say, I am smitten with Anna’s lovely artwork. And I’m guessing brides will be too. 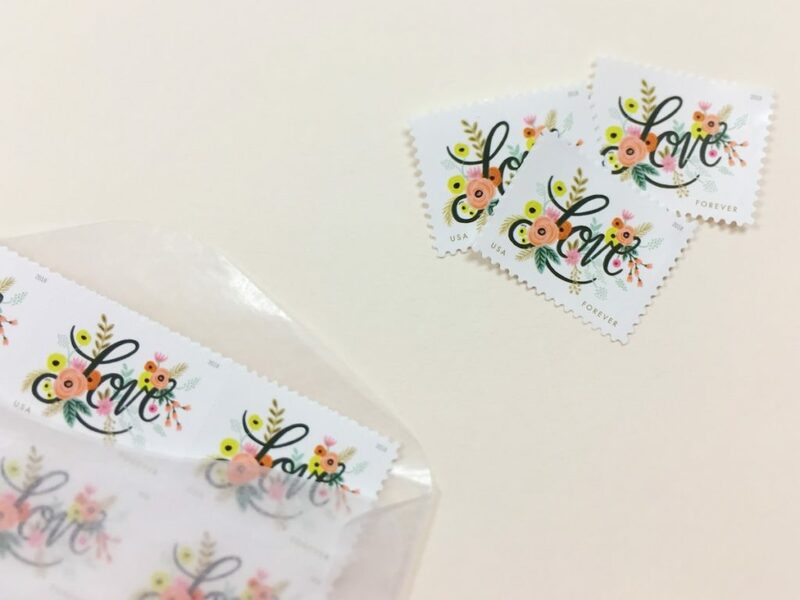 The love stamp will look perfect adorning the calligraphic envelopes of wedding invitations. And as a reminder for those exhibiting at NSS this year, Anna Rifle Bond is designing the commemorative box for the Legion Paper promotion for this year’s show, #PutAStampOnIt. I’m not gonna lie, I am so excited Parse & Parcel is a part of this fun promotion again this year. If you’re thinking about submitting an entry for the promo – hurry! The submission deadline is January 31st.